BIO-ORTHODOXY: Q & A: Why Is There No Official Orthodox Position on the Issue of Evolution and Origins? It is true the Orthodox Church has no "official" position on this topic scientifically, but the reason for this is because the topic is within the realm of science and not theology. Theologically we do have answers to the questions of origins. But scientific theories are adopted one day and dropped the next based on the evidence, and if the Church was to take a position on the topic it could lead to the same danger that condemned someone like Copernicus or Galileo in the West for disagreeing with an "official" position of the Church on a scientific matter. In the Orthodox Church, we have avoided such controversies and have always adapted with the scientific theories of the day, though the Church should also be open to the progress of science that may yield evidence in opposition to contemporary theories. Both science and theology are in the business of teaching truth and their conclusions can never contradict one another. The former is based on the evidence while the second on revelation. The former deals with the creation while the latter deals with the Creator. However, science is one thing and philosophy is another. The problem with modern science is that it has as its foundations not mere science but in fact a certain philosophical worldview. This is what Darwinism is - it is a philosophical worldview through which scientific evidence is understood. The danger in using science like this is that it creates a story, or even myths if you will, that are not based on evidence but on mere conjecture and imagination. So if members of the Church were to take a position, I would encourage them to avoid the use of philosophical presuppositions when evaluating scientific evidence. Regarding the theory of Evolution, I should mention that the great majority of Orthodox scholars believe in Theistic Evolution. Yet often they intermingle Orthodox theology with Darwinian philosophy - not science. Darwinian philosophy is based on materialism and naturalism, and Darwinian interpretations of the scientific evidence do not allow for a supernatural agent or a Creator to guide in the process of creation or evolution. This is not a view supported by the Saints and Fathers of the Church. This is often why contemporary Saints and Elders, like Paisios, critique Darwinism, without in actuality critiquing Evolution, but if they do critique Evolution it is because of how it is viewed by Darwinists - through the prism of naturalism. Alfred Russel Wallace, a contemporary of Charles Darwin, is an interesting scientist to read, who believed in a divinely guided evolution, or Intelligent Evolution. Such theories fit perfectly well into the writings of many saints on this topic, like St. John of Damascus, St. Seraphim of Sarov and St. Luke of Simferopol to name a few. St. Nektarios wrote on the topic of Darwinian Evolution, who was one of the first Orthodox Christians to offer a critique on this theory in the early 20th century, but even he merely critiques it as a philosophical and naturalistic theory and not as a scientific theory. Also, I recommend the booklet Biological Evolutionism by Dr. Constantine Cavarnos, a former Harvard professor of Philosophy, who evaluates Darwinian theory as a philosophy of naturalism that contradicts Orthodoxy, though he argues that even science lacks the evidence for it. But to say Christ loses His dignity if He became incarnated from descendents of apes is a bit like chasing one's tail; that God even became man is an extreme act of humility, and according to Genesis man was created from dust. So as Fr. John Romanides used to say, whether we believe man came from apes or dust is just as undignifying, for our value and dignity comes from the fact that we are created with the potential to become temples of the Holy Spirit, no matter where the material came from. Though I can be sympathetic to Creationism, it does the same thing Darwinism does, but instead of a philosophy, Creationism mixes theology with science. Therefore, this also limits both theology and science. It is also too literalistic when it comes to Scriptural interpretations and such exegetical methods are not adopted or endorsed by the Church Fathers in the strict sense. Creationism is basically a reaction against Darwinism and a product of Fundamentalist Protestantism. 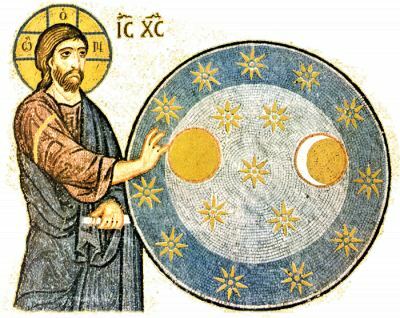 It is false to think that those Church Fathers and Saints who spoke the language of Creationism were Creationists in their scientific worldview; scientists did not rigorously begin studying the universe apart from theology until the Renaissance, though someone educated in these matters like St. John of Damascus in the eighth century wisely separated theology from the various cosmological theories of the world in his time without critiquing the latter. The weakness of Young Earth Creationism is that apart from the Bible you cannot arrive at any scientific evidence that speaks clearly to a literal seven day creation, whether it is true or not. You need your Bible to arrive at this theory; the same could be said when one believes Old Earth Creationism is science. Intelligent Design has its merit as well, in that it allows for a supernatural agent or a Creator or a Designer without the necessity of designating who "It" is, and it offers a strong critique of Darwinian naturalism. The problem with ID is that it tries to make itself into a scientific theory, when in reality it also is another philosophical theory, like Darwinism, that interprets the science based on its own worldview, whether philosophical or theological, without allowing the science to speak for itself. The reason people make these mistakes is because science often does not speak at all, but it yields results that can only be observed without necessarily going back in time to tell us the story of origins. Science is thus like a puzzle, but if we are missing a piece of the puzzle we may come up with a false picture. So yes, when it comes to scientific issues, we are as fish swimming upstream as far as guidance from the Church comes. But this is the only safe way to approach the issue. If we separate science from both philosophy and theology, as well as separate theology from both science and philosophy, we can honestly evaluate where the evidence lies and what the evidence truly says, even if it says little to nothing. What is most important is that the truths and revelations of Orthodoxy can never be compromised by true and honest science, whether the evidence inclines more towards Evolution, Creation, ID or anything else.